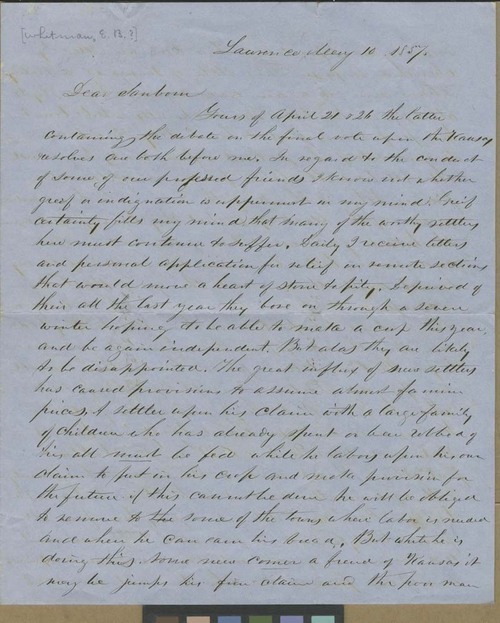 E. B. Whitman (letter not signed, but author's identity is pretty clear), an agent in Lawrence for the National Kansas Committee, wrote Franklin Sanborn in Massachusetts regarding his disappointment with the lack of support being given by "our professed friends" in the East. To their discredit, according to Whitman, Massachusetts "supporters" had refused to provide assistance which was desperately needed for the Kansas settlers who had just endured a very "severe winter." He believed false information was being circulated for political purposes by individuals within the Free State movement: "Kansas, bleeding Kansas, is of value to them only so far as it subserves their selfish ends."